Performs counter-in, analog/relay-out and repeater functions simultaneously. Integrated 100mw, 900 MHz SSFH radio for long-range performance. Outputs voltage, current and form-C relay status from remote sensors. Acts as a 900 MHz. pulse counter. Built-in 900 MHz. packet repeater functions. Learns sensor device IDs from unique packet serial numbers. 30-Bit unique ID on UOM (counter) packets. CRC-16 error checked on all packet transfers. Range Indoor: Up to 1300 feet. Range Outdoor: Up to 1 mile with standard antenna. Very small (3.25” X 2.5” X 1.125”) ABS Enclosure. External ¼ wave antenna or internal wire. 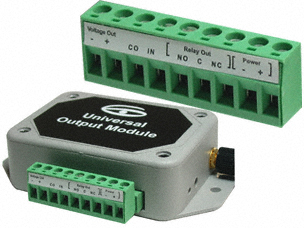 The Universal Output Module (UOM) provides analog output in both voltage and current forms as well as discrete form-C relay output. The UOM also acts as a counter, producing standard Point Six radio data packets as a single input counter accumulating active state time and number of activations of a switch closure input. Also, the UOM acts as a standard packet repeater for all Point Six 900 MHz. radio data packets. The UOM is married to Point Sensors with a simple ID-learn-sequence that stores sensor IDs in EEPROM so that the UOM knows which devices source the analog and discrete outputs. The UOM can be married to a single analog source and a single discrete source device at the same time while also producing counter device packets and repeating 900 MHz. packets from other Point Six devices. Analog output is produced in both voltage (0-5V or 0-10V) and current (0-20mA. or 0-40mA) at the same time with a common ground. The high/low analog output range is controlled by internal jumper selection and is shipped in the low range (0-5V, 0-20mA) mode. The relay output is an isolated form-C with 2-Amp contacts. The counter input is self-excited with 5V at 1 mA. referenced to the same ground as the analog outputs and the power input. This common ground architecture allows the UOM to be substituted for current mode sensors in 4-20 mA. remote applications. The electronics are coated with a conformal material that provides a moisture barrier against condensation. Submersion in water is not recommended. An internal pushbutton switch permits a user to activate the ID-learn-sequence and service mode functions.